Business is about relationships. Customers choose to do business with companies that seem knowledgeable of their unique industry, and invested in their success. LexisNexis Smart Meeting is a new service that gives companies an advantage when competing for business. An IDC (IDC is the research arm of PCWorld’s parent company, IDG) survey from 2011 found that sales and business professionals are often unprepared for initial customer meetings. In order to demonstrate knowledge and provide value, it’s important to be prepared with information about the prospective customer, and to be aware of current events and breaking news that impact the company. LexisNexis Smart Meeting can deliver relevant information directly to your iPad. The LexisNexis Smart Meeting service pulls relevant information from LexisNexis—a comprehensive source of company and industry news—and delivers a report to prepare sales and business professionals for client meetings. 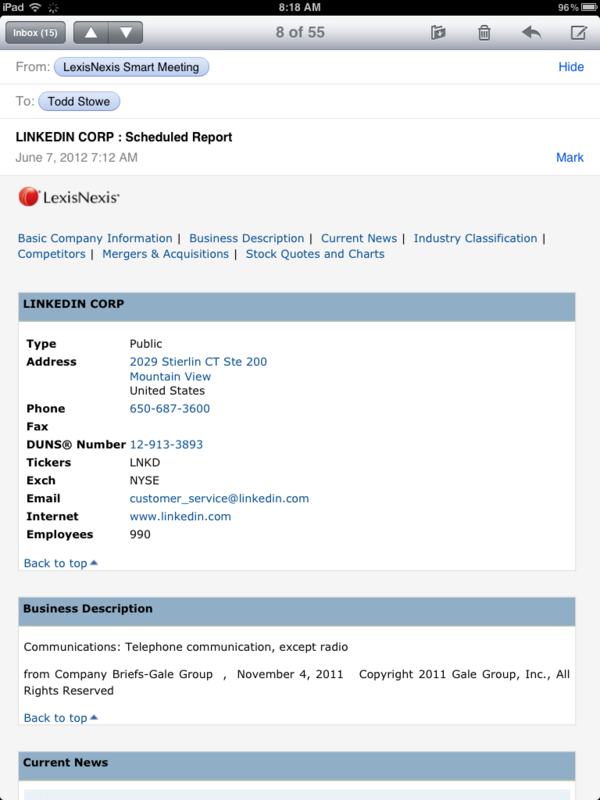 LexisNexis Smart Meeting integrates with the calendar in Microsoft Outlook to push breaking news and up to date company information immediately prior to scheduled meetings to give sales and business professionals an edge over the competition. When new meetings are added to the Microsoft Outlook calendar, LexisNexis Smart Meeting can check the domain names from the email addresses of the meeting invitees, and use that information to automatically search for relevant company information. The report provides the kind of news and information that can enable sales and business professionals to forge a stronger relationship, and win business they might otherwise lose. Business professionals on the go can have timely information at their fingertips from just about any computer or mobile device. LexisNexis Smart Meeting reports can be accessed and viewed from Windows or Mac OS X systems, iPhone, iPad, BlackBerry, and Android devices.